Shri Thanage has trained more than 15000 Police officers for cybercrime investigation, digital forensics and cyber law related topics. He has successfully consulted over 5000 cybercrime and other cases where technical investigation is involved. 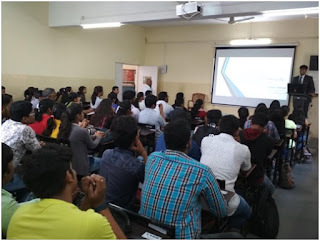 Considering his expertise in the field, the LL.B department of Modern Law College invited him to deliver a guest lecture on ‘Cyber Security.’ Sir had enlightened the students about various cyber crimes and threats like Hacking, Cyber Voyeurism, Stalking, Money Mulling/ Nigerian fraud etc. He also elaborated various security measures required for tackling these security threats. Sir has also thrown light on various career opportunities available in the field of Cyber Crime investigations and Cyber laws. The lecture received good response as 64 students attended the event.